Among the many beautiful rivers that Montana has to offer to nature lovers, the Smith River stands out as a favorite for both locals and visitors alike. That’s why the river is one of the top fly fishing destinations in Montana year after year. If you are getting ready to embark on a fly fishing trip to this corner of the state, then here is a closer look at what you can expect. One of the standout benefits of fly fishing in Montana is that many of the local rivers have high ethical standards, and Smith River is no exception. According to Montana State Parks’ website, you are expected to use sinkers and jigs made out of non-toxic materials, to never monopolize a fishing hole, and to keep out of sight from other anglers. Smith River fly fishing is ideal if you are looking to catch brown trout or rainbow trout of a decent size. 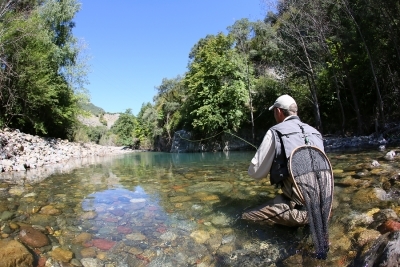 In fact, the river is renowned throughout the country as one of the best sites for trout fishing. Not only can its fame be attributed to the steady supply of fish it has to offer but also the beautiful nature that surrounds each individual fishing spot. Before embarking on your fly fishing trip in the Smith River, be sure to consult with guides or professionals in your fishing lodge about permit requirements. Unlike other rivers in the state, Montana does require permits for Smith River fishing. When you book a pre-arranged fishing trip with our guides, you can rest assured that all proper paperwork will be obtained. Another perk of booking a guided fishing trip in this river is that you will be provided with more than just guidance, but also convenience thanks to our full service transportation and food services. From wine and hors d’oeuvres in the evening to lunch each day, our staff will see to it that you are well fueled for your adventures.